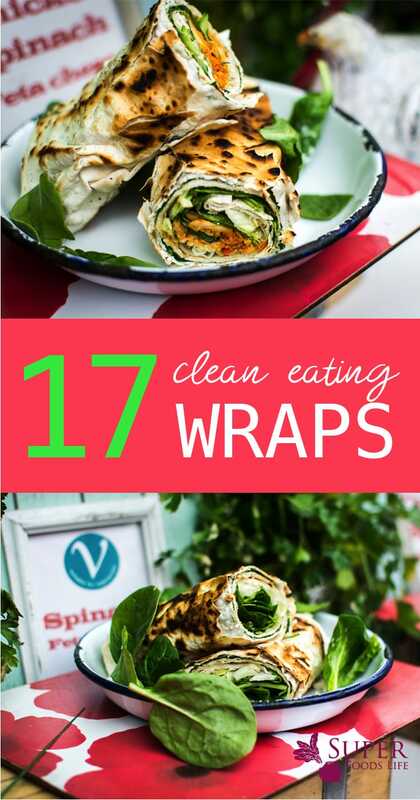 I’m here again with more clean eating recipes; this time around it’s all about clean eating wrap recipes. I chose to write about wraps today as a result of a discussion/borderline argument I had with a good friend of mine. In her opinion, wraps should only ever be made with tortillas. If it’s not a tortilla, she’s not interested. I, on the other hand, believe that there are too many amazing wrap options to limit it to just tortillas. From pita to lavosh to collard greens there is no shortage of delicious choices when it comes to wraps. If it’s a wrap you’re bound to love it, first because they are usually hassle-free and we can have them on the go and secondly there’s just something delicious about eating wrapped food. I guess it’s the feeling of combining your favorite food/ingredients together and eating them all at the same time…hmm…maybe that’s just me. Going back to the purpose of today’s purpose, what constitutes a good wrap? Personally, I’d go for sturdy, nutritious and large enough to contain a good quantity of my fillings. With that being said, I have listed out below some of the healthiest clean eating wrap recipes that fit the bill. 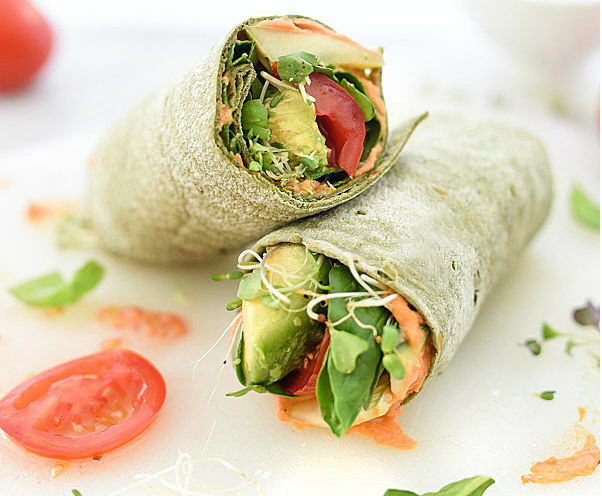 If you can handle a chopping knife, you can make this clean eating wrap because there is absolutely no cooking involved. If I were you, I would want to pair this up with a delicious homemade dip. 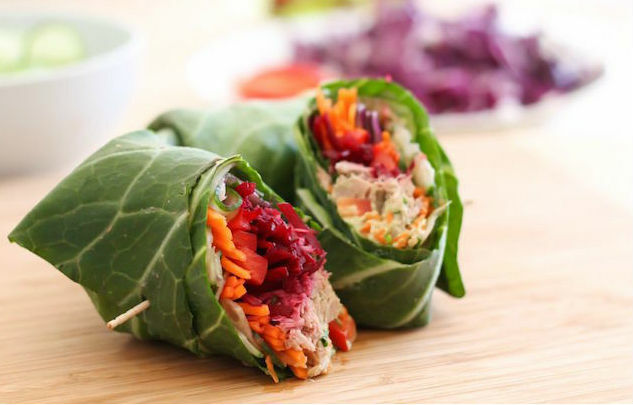 You’ve come too far to want to ruin these gorgeous tuna collard wraps with some unhealthy store-bought dressing. 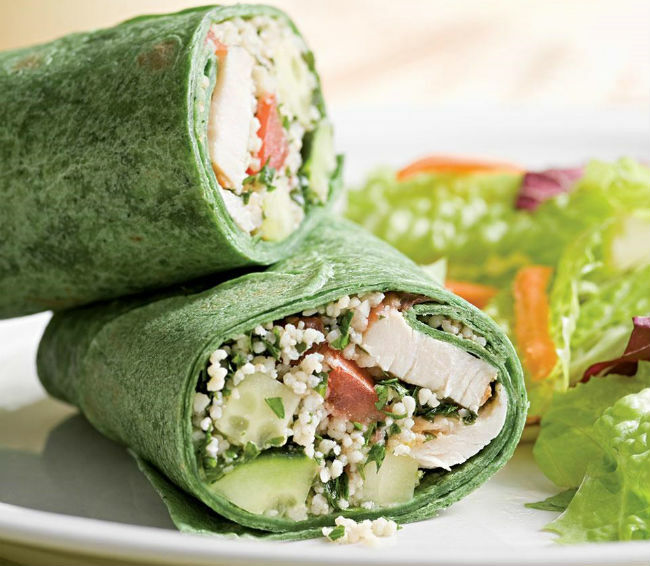 This wrap is a savory mixture of chicken tenders and couscous topped with a dash of lemon and some freshly cut herbs. It really is as nutritious and filling as it looks. 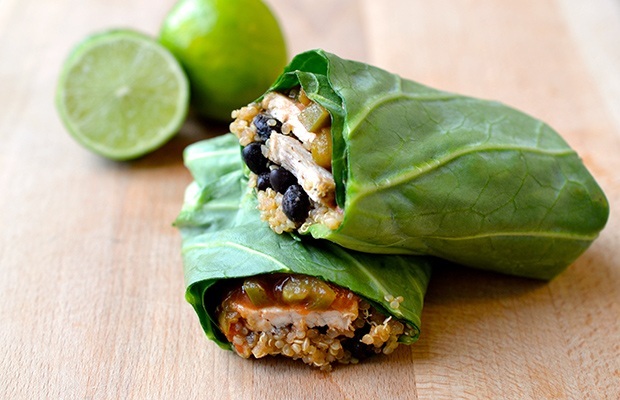 Craving a burrito but trying to eat healthier? Glorious news: now you can do both! Collard greens are sturdy enough for all your favorite burrito fixins’ and won’t break apart in your hands as you much on this gorgeous- and delicious- wrap. 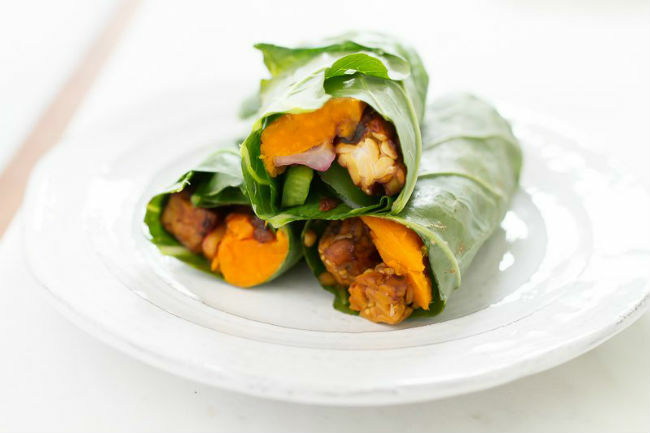 While we were in the “Collard Greens” neighborhood, I figured “why not include one with a different filling” and this Tempeh and Sweet Potato Collard Wrap with a total prep time of just 15 minutes was easily the winner for me. This recipe is almost a two-for-one- you get this veggie packed wrap AND the secrets to making the smoothest, creamiest hummus. Try swapping out the tortilla for lavosh or a low carb/high fiber tortilla. 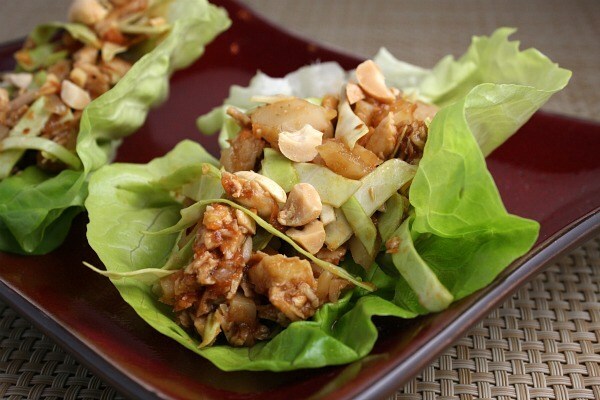 This is a nice and light recipe for those nights when you really want to skip the heavy high-calorie meals. This spicy taco wrap is paleo friendly, completely gluten free as well as dairy free. You really can’t go wrong with it. Skip the shawarma people! 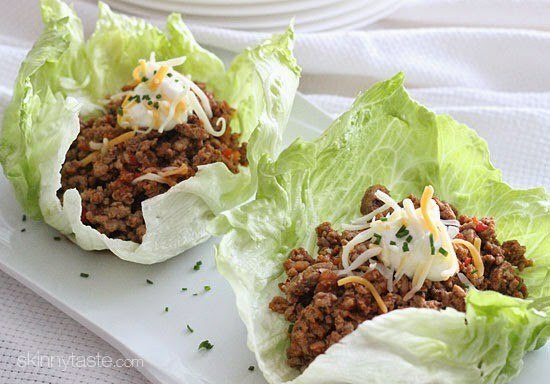 Here’s another interesting take on lettuce inspired wraps. This time around, we are going with some sweet and spicy chicken. In 28 minutes tops, you can make yourself this fabulous looking savory meal for dinner.